In her video cycle *Real World* German-born artist Halina Kliem presents a series of inner monologues that directly refer to situations and thoughts of everyday life. She has created a text image, which scrolls over a wall as if typed directly onto the screen. As the viewer follows the action and the images form in the viewer's mind, Kliem creates several concurrent movies. 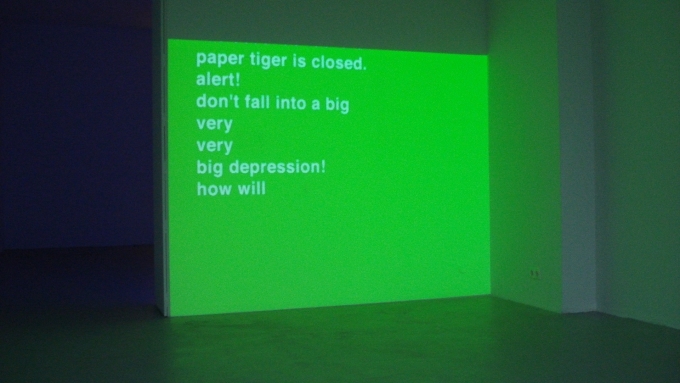 Not only does the viewer automatically associate the action with his/her own memories, but due to the speed with which the text image is projected onto the surface the viewer's perception of the action also changes. One is unable to capture all of it at once, even after several repeated readings. Kliem expands on film as a medium through this formal reduction - the movie is not watched, but read. Whether or not the plot is pure fiction or following a real diary is left open to speculation. 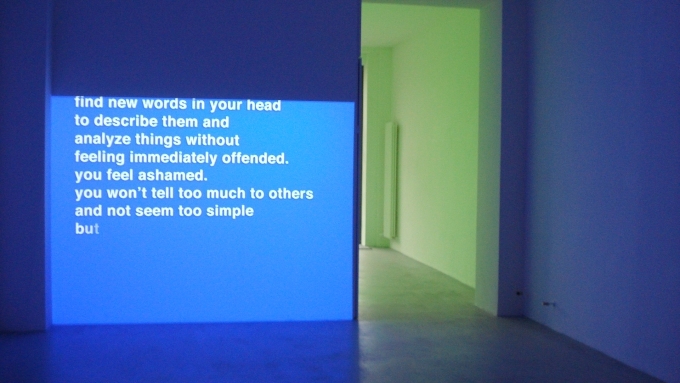 The synchronic screening of two videos from her "Real World" series turns the text into a form of poetry which again is visually reduced to a minimum: white writings on monochrome blue, green and magenta backgrounds. The typing in its restlessness also creates a rhythm disturbed only by tumbling, stumbling, re-writing and re-correction, looped without a beginning or end. Doubts, wishes and banalities of everyday life, but whose life? The action describes a person trying to manage the day, being perturbed by inner thoughts of failure, doubt and deadline frustration, or getting drawn into endlessly thinking about someone who seems to dominate the person's life. The perspective is seemingly without any space and time specifications, only over a period of time do we begin to understand that the author is likely to be female, characterized namely through her male psychological parents. Figures that appear with supercharged movie names such as Ray, Jay or Andy only give way for more speculation whether these are fictitious names or pseudonyms of real people. Only through pairing different videos of "Real World" a narrative strand evolves that creates a deeper insight into the life of the writer. The viewer then recognizes that it is the same person reflecting openly on various stages and situations of life and worlds of thought. Fluxionary boundaries between fiction and reality, created through this reduced form of display, have a hypnotic effect on the viewer, mirroring his/her own familiar life stages and ideas.